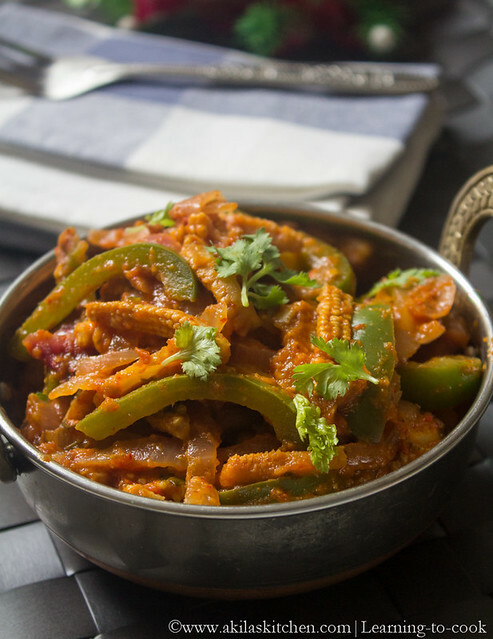 Baby corn Jalfrezi has become one of my favorite recipe. 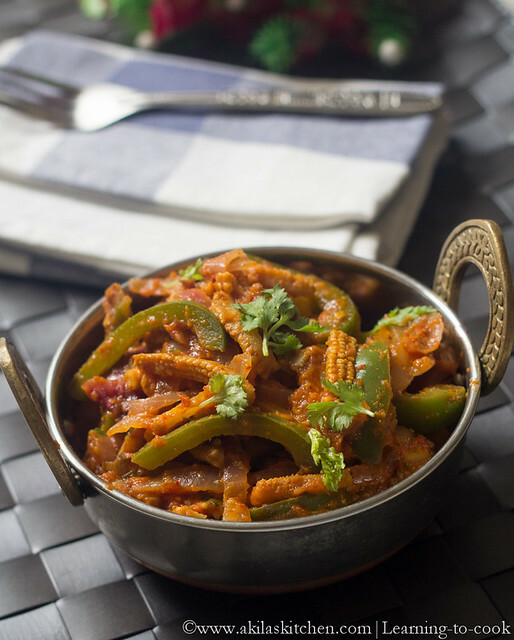 The crunchiness of the baby corn and the bell peppers and tanginess of the tomatoes makes it more flavorful. I took the recipe from here and came out good. I prepared this on Sunday for the Non veg menu. Will post the menu soon. Everyone in my family loved a lot. 1. In the wok or kadai, add oil and when hot add the cumin seeds. When it splutters add the onion and Ginger garlic paste. Sauté them nicely till the raw smell goes off. Meanwhile grind the tomatoes to a paste. Add this paste. 2. Add the chilli powder, coriander powder, turmeric powder, cumin powder and salt. Let them cook. Add 1/2 cup water. Add the baby corn. Let it cook for 5 min. 3. Add the capsicum. Let it cook. Do not over cook. The capsicum should be crunchy. Add the tomato sauce. 4. Let all the water content evaporate. 5. Give a stir and switch off the stove. 1. Do not overcook the baby corn and capsicum. It should be crunchy in the masala and not mushy. 2. You can also add Paneer to this. Spices in this dish is so loveable. Super hungry after seeing.